AMMONNEWS - Minister of Foreign Affairs and Expatriates Ayman Safadi affirmed that Arab-Chinese cooperation will pave the way for economic, commercial and cultural accomplishments that will reflect positively on both sides and contribute to ending conflicts, overcoming crises, achieving development and prosperity and establishing regional and international security and stability. In remarks during the 8th ministerial meeting of the China-Arab Cooperation Forum which was opened in Beijing on Tuesday by Chinese President Xi Jinping and Emir of Kuwait Sheikh Sabah Al Ahmad Al Jaber Al Sabah, Safadi said the convening of the forum is an important step towards forging closer Arab-Chinese cooperation that deepens the historical ties between China and the Arab world. "We have deep historical ties, and we are determined to build a future that strengthens and deepens these ties " said the foreign minister. Jordan, he added reaffirms the importance of strengthening cooperation with the People's Republic of China and the strategic partnership that was announced by His Majesty and the Chinese president during the King's visit to China in 2015. Safadi stressed Jordan's keenness on a wider cooperation with China in efforts aimed at resolving the Palestinian-Israeli conflict. He said China's support for the two-state solution, supports comprehensive peace that will be achieved through the establishment of an independent Palestinian state with East Jerusalem within June 4, 1967 lines. "These efforts must be activated. The current situation cannot continue. The occupation, new settlements, confiscation of land and unilateral measures are continuing, creating new facts in Jerusalem and threatening the historical and legal status of its Islamic and Christian holy sites," he added. Safadi said Jordan is also looking forward to working with China to reach a political solution to the Syrian crisis, adding that this crisis must end with a political solution that is accepted by the Syrian people and preserves Syria's unity and stability and allows the return of Syrian refugees to their homeland. 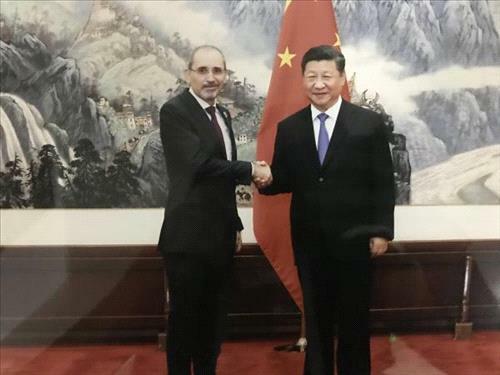 Safadi praised China's stances and policies of Chinese President Xi Jinping "in support of the security and stability of our region and for the development of Arab-Chinese relations." On the sidelines of the meeting, Safadi held talks with his counterparts from Egypt, Saudi Arabia, Bahrain, Palestine and the UAE state Minister. The foreign minister will later hold bilateral talks with his Chinese counterpart.